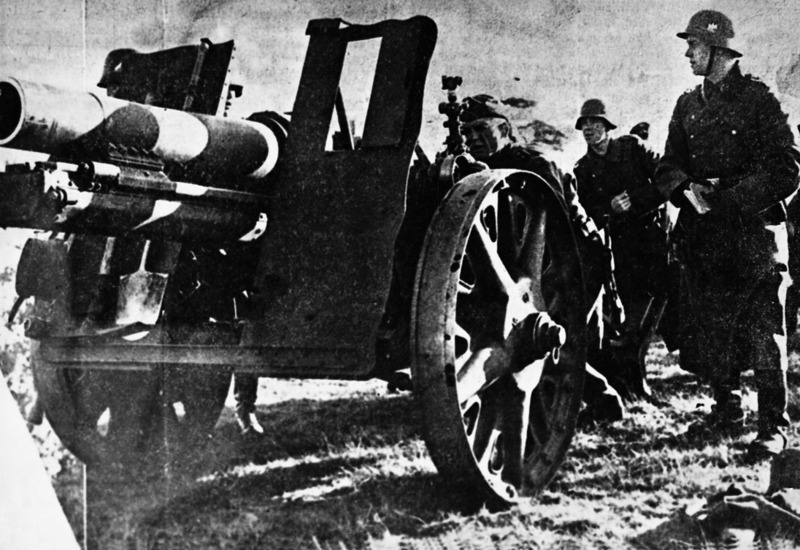 Of all the German infantry support guns produced for service in World War II, the most capable and powerful was the 15cm schwere Infanteriegeschütz 33. Produced by the Rheinmetall-Borsig company from 1927, the s IG 33 was a large item of equipment that gave the impression, largely as a result of its steel wheels with a diameter of 1.10m (43.3in), of being somewhat old fashioned. In this instance appearance was deceptive, for the s IG 33 was capable and very reliable, and as a result the weapon remained in large-scale service right up to the end of World War II in 1945. The s IG 33 had good minimum and maximum range capabilities for a weapon of its type, and could fire virtually the full range of ammunition types (including the 89.5kg/197.3lb muzzle-launched stick bomb to “take out” strongpoints and barbed wire entanglements out to a range of 1025m/1120 yards) for a weapon of its type. The s IG 33’s main drawback was its high weight, and before the outbreak of war in 1939 the Germans developed a carriage of light alloy rather than steel manufacture, which was then not put into production. So it was only after self-propelled mountings had been developed that the s IG 33 (later developed into the Sturmhaubitze 43 L/12 weapon) really came into its own. These mountings included the 15cm s IG 33 auf GW I Ausf B., the 15 cm s IG 33 auf Fgst PzKpfw II (Sf) Verlängert, the 15 cm s IG 33 auf Fgst PzKpfw II (Sf) SdKfz 121, the 15 cm s IG 33 (Sf) auf PzKpfw 38(t) Ausf H ‘Bison’, the 15 cm s IG 33/1 auf GW 38(t), and the 15 cm s IG 33 auf PzKpfw III.